BUILDING WEALTH THE NEW FASHIONED WAY. With over $8 billion under management, Gerstein Fisher, a pioneering investment firm specializing in quantitative, data-driven strategies, sought to reach a new wave of affluent investors. Drawing inspiration from the powerful symbolism and clean lines of Swiss Design, we updated every aspect of the Gerstein Fisher brand from its visual identity and graphic standards to how and where it engages potential, new clients. The firm’s own Multi-Factor®investment strategy suggests that when making smart financial decisions every factor counts. It is this same level of meticulous detail and consideration we applied when re-envisioning the brand. Devising strategies for reaching and engaging new customers is as complex as Multi-Factor Investing itself. Reinforcing Gerstein Fisher’s message with powerful headlines and visionary design, we look to catch potential new investors wherever we can, including their morning commute. 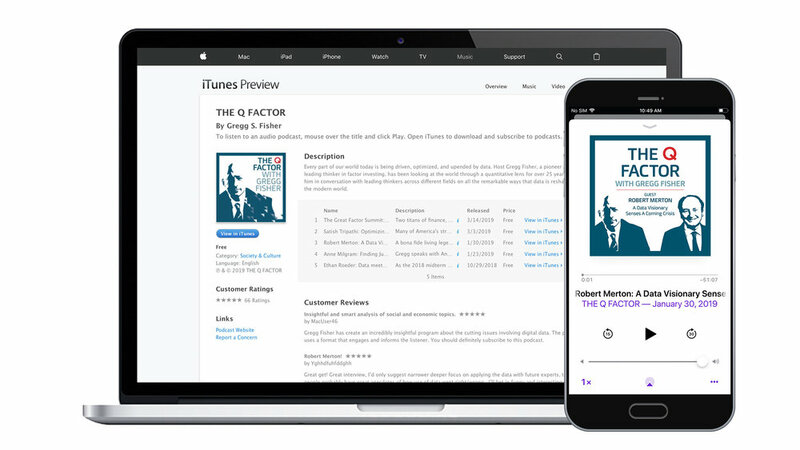 We are helping to develop and market an ongoing podcast series hosted by Gregg Fisher, Portfolio Manager, Head of Research and Founder of Gerstein Fisher. Viewing the world through a data-driven lens, The Q Factor explores all the remarkable ways information and big data is shaping our modern world.